From avoiding a costly catastrophe to simply monitoring the mundane home activity, AngelBlocks is working to accomplish an easy-to-use home automation system. The AngelBlocks technology allows for users to connect to any object in the home. AngelBlocks weigh less than a computer mouse and can easily be attached to various household objects with adhesive strips, magnets, and can even be securely fastened with screws if a consumer wishes. AngelBlocks can remind you when to water the plants, warn you if your dog gets into the trash, alert you that your toilet is over flowing, and even automatically lock the door when you leave the house. Each systems comes with one AngelGate, which ultimately acts as the “brains” of the unit. The AngelBlocks themselves are attached to various household objects and registered online with a web application so it can be monitored. 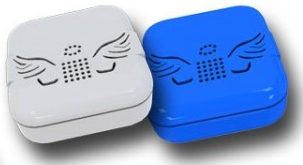 Each AngelBlock can programmed to perform specific tasks at specific times based on what it senses in the environment. When they are not activated, the AngelBlocks only send a signal to the AngelGate every two to three hours to let it know it is still operating. This means each AngelBlock can operate on one set of AAA batteries for up to five years. The AngelBlock system does not use the cloud to avoid security breaches. However, Montgomery warns customers that they should not hook up to everything in your house, even if it does have its own unique ID number. AngelBlocks is also a “Kickstarter” project, which is typical of up-and-coming home automation technology. The company was able to generate $45,000 to go towards the project, and the creators plan on taking it to the next level.